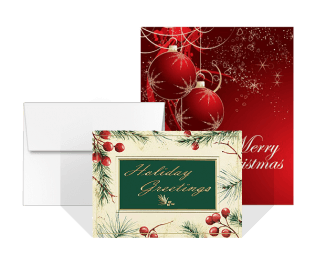 Greeting Cards are large, folded note cards with an area for a personalized message on the interior. They are a popular way to celebrate holidays and special events. Usually, they are colorful and have images on the outside. The most common order options are 10" x 7" before folding on 14 Pt. Gloss Cover stock. Almost always, Greeting Cards are printed in full color on bothsides (4/4) and are often coated UV 1 Side. Once folded, these options create a 5" x 7" card with a high gloss finish on the outside front and back.